Livermore native Jim Hurley began his music education in local public schools. He later studied violin with Dr. Madeline Schatz, a student of Jascha Heifetz, and earned his B.A. Music from Humboldt State University in 1981. He has performed with Queen Ida's Grammy-winning Bon Temps Zydeco Band, Deep Purple guitarist Ritchie Blackmore, the Trans-Siberian Orchestra with Jon Anderson from Yes, Dan Hicks, Al Stewart, Josh Groban, Smokey Robinson, Stanley Jordan, Zhao Hui, the Waybacks, Tempest, and Ancient Future. He has appeared on Saturday Night Live, at the New Orleans and Monterey jazz festivals, the Philadelphia, Winnipeg and Strawberry folk festivals, a few stadiums, some european castles, and numerous other venues, large and small, in 15 countries. His playing is featured on many dozens of recordings. He performs locally with his original jazz quartet, Night Harvest; also with American Idol alumnus Wolf Hamlin and The Front Porch Drifters, featuring winemaker Karl Wente. Night Harvest re-brands as The Surly Jackasses to back singer/songwriter Suzanna Spring. The combined Las Positas College orchestra, jazz band and dance department performed Hurley's Modern American Nutcracker for their 2013 Holiday concert. Jim collaborated in October 2014 with alumni of Rod Stewart, Jefferson Starship and The Tubes as Whograss, for a unique show at S.F. 's Hardly Strictly Bluegrass Festival. Jim also serves as Artistic Director and instructor for Music Pathways, a non-profit music education foundation, affiliated with Livermore Valley Education Foundation. Links to Jim's discography, YouTube, and photos. "Jim Hurley is a walking musical United Nations. Blending influences from India to Zaire, jazz to zydeco, Hurley is one of those leading the charge into a melodic realm called world fusion." 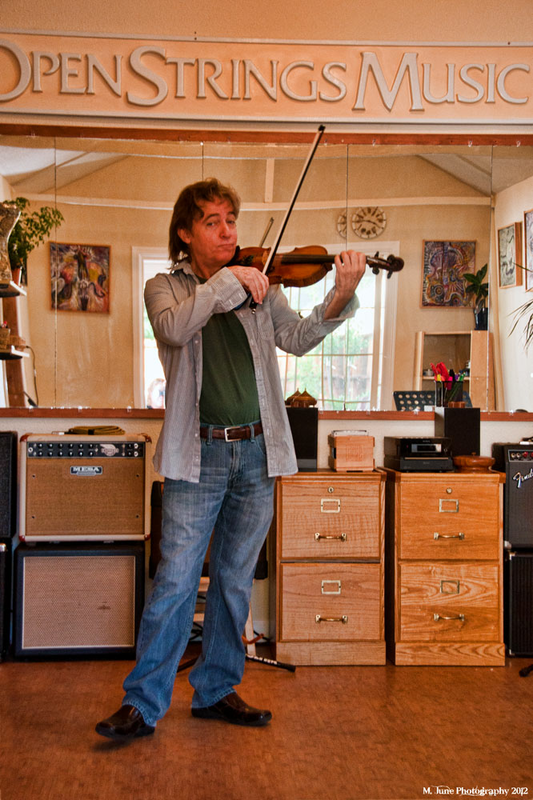 "Violinist Jim Hurley plays with technical brilliance and gypsy-like fire." "Hurley... could stand toe-to-bow with any jazz,bluegrass or rock violinist today." "Incendiary...Hurley's fiddle put the bow-shredding antics of cajun fiddler Doug Kershaw in their proper perspective." "Particularly noteworthy was Jim Hurley's extended, gypsy-tinged violin solo on the old Hot Licks' tune "I Scare Myself"." "Move over, SoMa; some of the hottest Thursday night jam sessions west of the Big Apple are happening in a renovated newspaper building right smack in downtown Livermore. If you're lucky, you might even catch the Beanie Babies and Doody Heads, an eclectic string quartet of elementary school-age musicians, or perhaps some of their middle-school counterparts performing an unusual mix of Pachelbel and Green Day. These Thursday night events aren't your average piano recitals; but then again, Jim Hurley isn't your average music teacher." Jim Hurley founded Open Strings Music Studio in 1997 in the loft of the historic Schenone Building in downtown Livermore. He built artists' studios, as well; a variety of art classes, programs and events shared the spacious facility with his music program. In 2003 Open Strings moved to a two-bedroom cottage on Second Street; a small group of music teachers shared three lesson studios, and a few art classes continued on at this location. In 2007, Fine Fretted Friends music store, downtown, was expanding, and Jim helped to design a suite of lesson studios that became, that October, the next home of Open Strings. In 2009, Jim renovated an old structure adjacent to his 100-year-old south Livermore home. In this small, but comfortable, venue, Open Strings continues to serve the community. The studio is situated behind the house, which is a private residence. Please walk to the end of the driveway to the right of the house, and through the open gate. There are waiting areas outside and inside the studio building. No 'drop-ins'; lessons are by appointment only; lessons in session will not be interrupted for unexpected visitors. Please call or email first. No parking in the driveway, which is shared with a neighbor; there is abundant curbside parking in the immediate vicinity. An overview of educational content offered at Open Strings Music Studio. The music library at Open Strings overflows with treasures I have collected in nearly 40 years of musical travels and explorations. All music has been carefully edited, annotated and updated for optimal educational value and utility. There are an abundance and wide variety of examples to entertain and amuse, as well as educate, students young and old, at all stages of musical development. Music theory and instrumental skills are highlighted throughout. Improvisation, arrangement and composition are encouraged and facilitated, as well. A vast assortment of musical styles and genres are featured. Along with the treasures of the classical world, there are celtic, zydeco, gypsy jazz, mediterranean, latin and asian examples, in abundance, as well as many varieties of folk, jazz and rock, vintage and modern. And students may pick and choose as they will. Strict, narrow, and rather boring violin 'method books' are published by Suzuki, 'Strictly Strings', Belwin, Mel Bay, and others. The tedious regimen laid out in these common instruction manuals has led a few generations of otherwise inspired students to eventually quit playing music altogether, and to apply their talents in more enjoyable pursuits. I love, and teach, the music of Vivaldi, Bach, Mozart, and more, but medieval music need not be taught by medieval methods! These sad, weary 'method books' are not used at Open Strings. Students are not tested, scored, rated or ranked. There are no 'second fiddles' at Open Strings! Drills, exercises, etudes, 'contest style' fiddling, 'pupil's concertos', and other music designed for competitive use is not included in the curriculum. Music is presented as a broad field of creative artistry, like poetry or painting, rather than as a branch of competitive athletics. Students are encouraged to learn much, to play their very best, to create, and to share their ideas and insights with their fellow students. Education is offered, rather than 'training'. The Open Strings program may not offer the desired opportunities to a student who aspires to compete and win. Musical content at Open Strings is chosen for intrinsic merit and musical significance. Mass-marketed tween-pop music, with tie-ins to movies, TV shows, celebrities, and fast food, is not highlighted here. Kids are sufficiently bombarded by commercially-driven stuff in the media channels aimed at them. They deserve better musical opportunities, and the Open Strings library offers them a wealth of worthy alternatives. If you aspire to understand your guitar, and all of its musical resources, from one end to the other, you have come to the right place. If you wish to gain a comprehensive understanding of scales and chords, musical form, rhythm, phrasing, articulation, good technique, and how they all fit together, this knowledge is available to you. If you would like to explore a broad spectrum of musical examples and styles from around the world, Open Strings offers you this opportunity. It is sometimes assumed that a guitarist is also a singer. I am not a skilled or knowledgeable singer, and vocal instruction is not featured in the Open Strings program or curriculum. No 'tab' at Open Strings! Tablature (tab) has become a popular shorthand form of musical notation for guitar hobbyists. Lacking, unfortunately, even the letter names of musical notes, tab offers a student no clues as to how notes might add up into scales and chords. Since it provides no framework with which to understand musical content, this crude notation keeps the student perpetually dependent on the tab provider. Standard musical notation, therefore, with explanatory annotation, fingerboard diagrams and identification of harmonic elements, is used at Open Strings. Instruction is also available on mandolin and on bass guitar. Although I am familiar with viola and ukulele, the Open Strings library does not contain sufficient resource materials to teach students properly on these specific instruments. An aspiring violist would do well to learn violin first, though, and ukulele is easily played by any knowledgeable guitarist. Kids, teens and adults require very different styles and methods of teaching. Developmental and stage-of-life issues define and differentiate the educational needs of students in these quite separate categories. Kids have some unique attributes, as students. They are naturally curious and rather open-minded musical omnivores. They don't tend to mind starting at the beginning, and playing simple, fun songs over and over, as they gradually get their bearings. They will happily play together out of tune and out of time, improving all the while. They aren't yet the picky eaters they will become as teens. In general, if they are supplied with an abundance of easy, fun music, given some choice in the matter, and, soon, an opportunity to play together, regularly, with their peers, without criticism, competition and pushing, they tend to develop the skills and graces of musicianship easily and naturally; they do so, in fact, with considerable relish. And music will remain a joy to them, for the rest of their lives. First, the provision of lots and lots of fun and easy music, carefully selected, arranged and sequenced to suit the students' evolving developmental needs, with students at liberty to pick and choose from an abundance of available examples. Fairly soon, an opportunity for them to play music together, regularly, with their peers, in an informal, non-competitive setting. A bit of democracy can be a nice touch. The introduction of new musical knowledge and skills without haste, sequentially, clearly, and with sufficient practical guidance that each step will, literally, 'make sense to a child'. It is the teacher's duty to exercise humility, forego criticism, demonstrate understanding and kindly lead the teenage student towards learning, discernment, and attainment. This generally requires starting with the teen's own chosen music, which the teacher must be able to instantly analyze, transcribe and play, upon hearing. A teacher who cannot do this, and must click and download, during the lesson, from online 'tab' providers, is not really teaching the student anything. To help the teenage student to fulfill such great learning potential, a teacher must not only have useful answers to the student's immediate questions, but must have the knowledge and experience to anticipate and answer the questions that will follow, and to lead the student on a path towards even more relevant questions. With teens, it is most true, "Education is not the filling of a bucket; it is the lighting of a fire…"
The maturity of adulthood confers benefits in the areas of commitment, attention span, work habits and organization. Along with the wisdom of age, though, there sometimes comes a diminishing athleticism of the fingers and a less-than-teenage capacity for rapid assimilation of knowledge and skills. To play a musical instrument can be, for an adult, a meaningful, pleasurable, life-enriching activity, and a potent antidote for the stresses and strife of adult life. A teacher should aspire to serve, rather than to lead, the beginning adult student.